Thomas-Wright Battlefield - Explore! Thomas-Wright Battlefield - Explore! 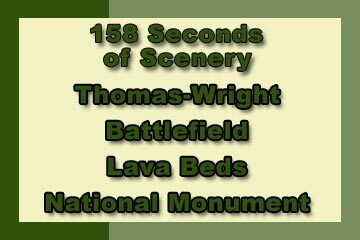 or The Battle of Sand Butte – Lava Beds National Monument . . . The Park Service labels this site the Thomas-Wright Battlefield. This, the fourth battle of the Modoc War (after the battle at the Lost River, and two battles at Captain Jack’s Stronghold) was actually fought between a U.S. Army patrol led by Captain Evan Thomas and a small band of around 20 or 22 Modoc Indian warriors led by Scarfaced Charley. 1st Lt Thomas F. Wright was one of four officers that accompanied Thomas and his 59 enlisted men. The patrol set out on April 26, 1873 with two purposes. First, Thomas was to locate the Modocs, that had left Captain Jack’s Stronghold on the night of April 16. Second, he was to find a trail that would allow the army to move their howitzers and mortars to an attack position. He was not expected to confront the Indians. 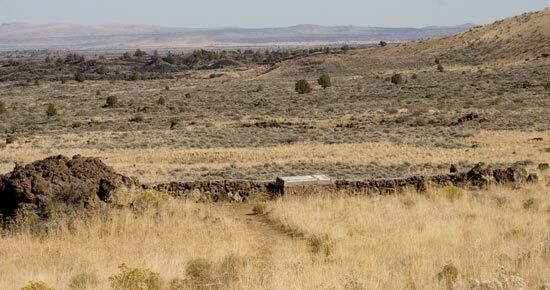 A patrol of Warm Springs Indians that were working as scouts for the army had located the Modocs on April 20 about four miles south of the Stronghold in the Schonchin Lava Flow not far from what is now known as Hardin Butte (then known as Sand Butte). Thomas’ Patrol left Gillem’s Camp at around 7:00 am and arrived at a position near the butte around noon where they rested. As they ate their lunch, rifle fire erupted from points to the east, south and west. After being beaten back at every attempt to move on the Indians and taking heavy casualties, many of the troopers ran for their lives toward the north and Gillem’s Camp. The remaining officers and about 20 men remained to defend themselves, but were all killed or severely wounded. The geographic advantage to the Indians and disadvantage to the army is obvious in the short video we present below. The troops at the Stronghold and Gillem’s camp heard the battle, but even after the first soldier made it back to Gillem’s Camp at 1:30 pm they couldn’t believe the disaster that had unfolded. By the time troops were organized and on their way to the butte, it was nearly dark and the weather was deteriorating. It took them six hours to cover the four miles to the battlefield. Unable to find many wounded in the dark, the rescuers were shocked at the number of bodies and wounded men they found the next morning. The Army and Navy Journal later reported: “the bodies of Captain Thomas, Lieutenant Howe, Acting Surgeon Semig, Sergeant Romer, and six others, were found hidden in some sage brush stripped naked. Lieutenant Wright’s body lay a little to the left (of Thomas), and on the right was Lieutenant Harris, severely wounded, and the bodies of five of his men, stripped of all their clothing.” After some very tough going, the rescuers were able to move the wounded to Gillem’s camp, arriving on the morning of April 28. 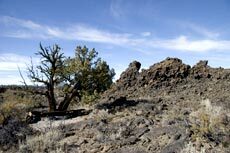 The patrol initially moved to Hardin Butte through the area between the Schonchin and Devil’s Homestead Lava Flows. When we looked at the area using Google Earth, we saw a very well-defined road leading from the north edge of the Monument to Hardin Butte. I entered some coordinates along the route into my GPS unit then went to the starting point, about 0.6 miles east of Canby’s Cross (N 41˚ 48.855′ W 121˚ 31.929′). I could see nothing resembling a road from the paved road. I walked to a second point on the old road, about 1/4 mile in (N 41˚ 48.678′ W 121˚ 31.983′) and the road became obvious. There are old fortifications along the road, apparently constructed by the army. The road winds through the lava beds right to the butte. As Thomas and his patrol left Gillem’s Camp they generally followed the shore of Tule Lake to somewhere near that point east of Canby’s Cross. The observant explorer will see numerous broken shells in low areas to the south of the main road near here indicating the original shore of Tule Lake. If you are particularly adventurous, you can walk along the old road (it is closed to vehicles). Just be sure someone knows where you are, take plenty of water, and watch for rattlesnakes. This is probably as close to the actual route the patrol took as you are going to find. A bench in the shade of a juniper tree on the trail to the battlefield. The less adventurous can drive to the Thomas-Wright Battlefield Trail (same as the trail to Black Crater) located on the main road a few miles south of Gillem’s Camp. This well-maintained trail is about 1.2 miles long. It leads past Black Crater to a viewpoint and interpretive panel overlooking the battlefield, where it ends. The panel displays the exact position of the troops when they were attacked. I highly recommend that you walk down the hill to that point to get a real feel for the hopeless position the troops were in. As shown in our video, the Indians had a great view and could easily target the troopers at ranges from 400 to 1000 yards – close enough for Indian sharpshooters to have a devastating effect. On the other hand, the troops were in a hole – a sort of box canyon formed by lava flows – and had only one way to escape, to the north. You can extend your explorations onto Hardin Butte and into the Schonchin Lava Flow to get an even better feel for the Indian viewpoint. A quote on the interpretive panel struck me as odd. It was attributed to Scarfaced Charley, suggesting that he ended the battle on humanitarian grounds. It’s been published different ways: “All you boys what ain’t dead had better go on home. We don’t want to kill you all in one day!” or, more simply: “We’ve killed enough of you, now go home.” If he had indeed stopped the battle, it was only after no one remained except the dead and some badly wounded soldiers. I was not able to find a primary source for the quote, but I doubt it was Scarfaced Charley. Rather, I suspect it was one of the troopers that raced back to Gillem’s Camp when the battle started. Perhaps, it was a way to explain why he was still alive. 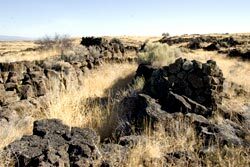 From the Indian perspective it made no sense to try to chase down the fleeing soldiers while leaving their families unprotected in the lava beds, especially when they were aware that a group of Warm Springs scouts was nearby and surely suspected that more troops were heading their way. Based upon my research, it looks like the battle simply ended when there were no more soldiers shooting at the Indians. I ended up with an overall rating for this adventure at 7.0 – the same as Gillem’s Camp and Captain Jacks Stronghold. It’s great western scenery at all three locations. Here, with the four-mile hike in from the north as well as the opportunity to explore considerable high and low ground, you have options for greater adventure. The variety is similar to the other historic sites in the Lava Beds. Naturally, the historical aspect rates a 10. I rated this area a little lower in its attractiveness to kids. 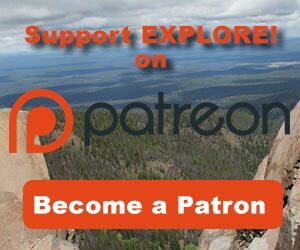 They will enjoy the trail in and the history of the battle, but you will need to warn them about rattlesnakes if they get off the maintained trail. The text, photos, video and graphics were prepared by Jerry Haugen, Pathfinder, and are ©2010 Global Creations LLC, all rights reserved. 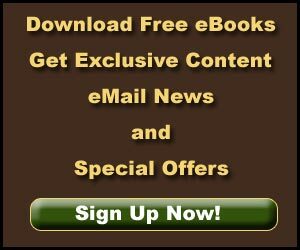 Information about the battle was derived from Park Service materials and the book Modoc War – It’s Military History & Topography by Erwin N. Thompson.